Missouri softball kicked off Big 12 conference play with another run-rule victory, defeating rival Kansas 10-0. Chelsea Thomas got the win, giving her a 9-1 record on the season. She pitched four and one-third shutout innings before allowing one hit in the top of the fifth. Lindsey Muller led the team and went 3-for-3 with one RBI while Corrin Genovese and Nicole Hudson each recorded two hits. In the last play of the game, freshman Kelsi Jones drove in three RBIs with her third home run of the season in the bottom of the sixth inning, helping the Tigers end the Jayhawks’ 20-game winning streak. Due to Saturday’s weather, the Tigers and Jayhawks will play a double header on Sunday, starting at noon. Consistency from the mound and a late home run delivered the Missouri Tigers to a 4-0 win over the Arkansas Razorbacks in their first midweek game of the season. Against a future SEC rival, the Tigers proved to be a threat to the Razorbacks as senior Chelsea Thomas dominated the mound with four no-hit shutout innings. Freshman Bailey Erwin took the mound to relieve Thomas in the fifth. Erwin allowed the one of the only two hits of the game to Razorback Amanda Geile. Geile would remain on first as Erwin forced three outs at the plate. Senior Kristin Nottelmann allowed one hit and one walk at the bottom of the seventh, but the Razorbacks could not deliver. The Tigers wasted no time as Nicole Hudson singled to bring in Jenna Marston, reached on a fielder’s choice in the first. Senior Ashley Fleming then scored on an unearned run, bringing the Tigers to an early 2-0 lead. The score froze as the Tigers struggled to bring home any runners on base, leaving eight teammates stranded on the game. At the top of the third, Marston singled to left field but is out at second after Fleming batted to first. Kelsea Roth and Hudson each took a hit from Arkansas pitcher Ciara Clampitt and walked to load the bases. Angela Randazzo and Lindsey Muller lined out to shortstop Clarisa Navarro and third baseman Chloe Oprzedek, ending the inning with three runners stranded. Krebs got on base and advanced to second in the fourth inning, but was left stranded as Genovese grounded out and Marston struck out at the plate from relief Razorback pitcher Chelsea Cohen. At the bottom of the inning, Navarro was hit by a Thomas pitch and stole second after Devon Wallace is struck out swinging. Navarro would stay put as the Razorbacks continued to ground out to end the third. In the fifth, the Tigers loaded the bases quickly as Fleming singled up the middle and is pushed along with two walks for Hudson and Randazzo. Muller and Krebs were unable to bat in their teammates as they struck out and grounded out to end Tiger infield play. The Tigers woke up in the seventh when Randazzo hit her first home run of the season, bringing in Kingsley for a Tiger 4-0 gap. Fleming led the Tigers with two hits and one run scored against the Razorbacks. The Tigers now look to the weekend as they kick off conference play in a three game series against the Kansas Jayhawks at University Field, starting on Friday at 6 p.m.
Power hitting pushed No. 12 Missouri softball to close out an undefeated record at the DeMarini Invitational with its fifth and sixth straight run-rule victories against Alcorn State, 9-0, and Northern Illinois, 8-0. Against the Alcorn State Braves, Kelsi Jones joined Lindsey Ubrun as the second Mizzou player to record at least two home runs in one game. Corrin Genovese hit her second home run of the season against the Braves. Princess Krebs continued the home run trend with one against the Northern Illinois Huskies. Genovese started strong in the first, with a home run to give Missouri the 1-0 lead. A Genovese triple in the second scored Jones and Rachel Hay. Kayla Kingsley took her home with a base hit. Clutch pitching by freshman Bailey Erwin stranded two Braves on base and kept the score at 4-0 at the top of the third. Jones then added the sixth run with her first homer of the day. In the fourth inning, Jones delivered with a powerful grand slam sending Mackenzie Sykes, Kelsea Roth and Angela Randazzo home. Erwin sealed the shutout in the fifth after striking out a batter with two threatening Braves on base. Jones also drove in five runs, the most RBIs recorded by a single Tiger in one game this season. Genovese went 2-for-2 with two runs and a career-high three RBIs. The shutout win improved Erwin to a 4-0, with three strikeouts and only four hits. The Tigers and the Huskies put runners on base in the first two innings but did not light up the scoreboard until the bottom of the fourth. The Huskies came close to recording a run when Huskie Jennifer Barnette hit a single with players on first and second. Hudson got the out when the runner tried to run for home, preventing a Tiger deficit. In the bottom of the second, the Tigers struggled to hit players home, leaving six batters stranded. The game changer came when Krebs hit a line drive to center that put her on base with one out. Mackenzie Sykes then hit a fly ball into right field recording her first career triple, which scored Krebs. Sykes scored after a wild pitch, putting Missouri on the board 2-0. The Tigers found momentum and batted in six more players in the fifth off of five hits. Defensive errors contributed to three Tiger runs to lead off the inning. Kelsea Roth drew a walk and ran home after Hudson hit a double. A base hit by Angela Randazzo sent Hudson running for third, but Huskie catcher Erika Oswald missed the attempted out at third with a wide throw into left field that helped Hudson contribute a 5-0 cushion. And then Krebs capitalized. She scored Muller off her first home run of the season. Sykes got on base and advanced to third by the time Ashley Fleming batted her in with a line drive to center. Krebs finished 3-for-3 with a homer, two runs and two RBIs. This win gave Kristin Nottelmann a 5-2 record with six strikeouts and only three hits. 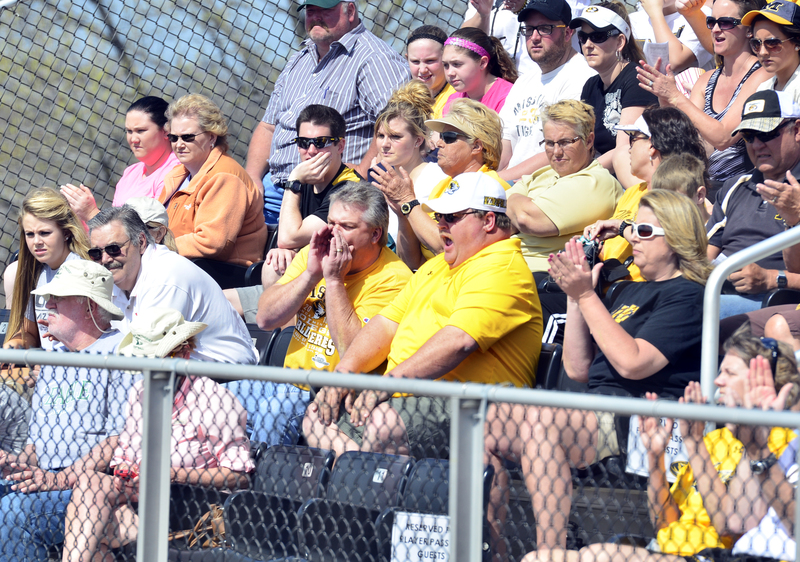 Missouri softball will head to Fayetteville on Wednesday to face Arkansas at 1 p.m. The Tigers face their first Big 12 competition when they host Kansas in a three game series starting on Friday at 6 p.m.
Information from MU Athletics was used in this report. Redshirt junior Chelsea Thomas is gaining a lot of national attention for her record statistics on the mound for Mizzou softball. Watch as Vox tests if she know just how impressive she looks on paper. *I pitched, edited and produced this package. CLICK HERE for the full feature story.